A large-enough working space without any foot traffic ? you don?t want other people constantly walking in the middle of your project, where they could interfere or be put in harm?s way. Protective clothing ? this goes with safety glasses. You want to minimize the amount of exposed skin. A filler and mixing board is a necessity when it comes to car body repair, since they are the primary tools used for filling in scratches and dents. The problem is that there is ample opportunity to cheap out on these products, because there?s a lot of inexpensive brands out there. Don?t try to be cheap. Use high quality filler and mixing board even if it costs a little bit more. The old adage ?you get what you pay for? applies here. You don?t want to end up with cheap looking results. Most car work is done indoors, mostly in a warehouse or a garage. This helps maintain a controlled environment, but it also restricts lighting. So make sure your garage is brightly lit with the right kind of task lighting. Make sure you can see the smallest hairline cracks and scratches before you even start working. These equipment can add to your expenses, but it?s a must if you want to do a proper job. 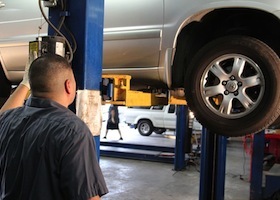 This is why it?s smarter to leave car body repair to professionals such as Davies Auto Care. You don?t need to spend several hundreds of dollars on equipment that you are probably not going to use regularly, and you also get the benefit of experienced people working on your car. And auto shops guarantee their work, so you don?t need to be worried of anything. All you need to do is wait for the work to be done, so you can go back to driving your car. If you have need of car body repair, as well as other car maintenance, repair, and vehicle inspection services, contact Davies Auto Care and we will give you a FREE quote.